'Docklands' was produced by Trevor Horn. 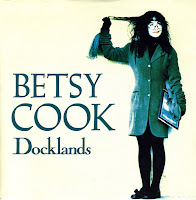 It was the only track on Betsy Cook's album 'The girl who ate herself' that was produced by him, and that fact alone must have been enough to make this track a single. Well, it was good enough for me anyway: I loved the whole album, and so I bought all the singles that were drawn from it. I didn't know about this single until I found it in London - fortunately by that time it had arrived in the sales bin.